The philosophical question that asks if a tree falls in the forest and nobody’s around to hear it, does it still make a sound has long been a popular subject for educated debate. 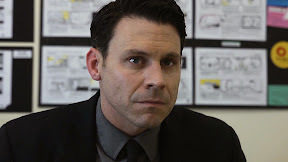 And by swapping out the forest for humanity and the trees for relationships, in some respects, writer/director Paul Osborne has crafted the cinematic equivalent of that very question with his latest production Favor which examines the limits of friendship under the guise of a modern day Film Noir. Namely, and by way of truly alarming circumstances, Favor asks if a friend from your past that you hardly see in the present is still someone you could (and would voluntarily if meeting for the first time today) call a friend. And if they are and they came to you out of the blue in desperate need of your help, how much of your future are you willing to put on the line for what you had with them in the past vs. what you have with them in the present? 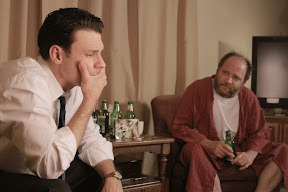 And history, as actor Blayne Weaver’s visibly nervous married ad man Kip tells his out-of-work, down on his luck pal Marvin (Patrick Day) means something. More than just being able to show up at Marvin’s door unannounced in the middle of the night (after what we gather has been an extended period of time), the history of their friendship inspires Kip to awkwardly and not so subtly lead into the real reason for his impromptu visit. 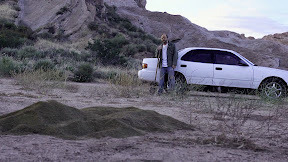 Recalling an old macabre adage that Marvin used to say growing up, Kip quotes his friend’s childhood philosophy that while a friend would help you move, a good friend would help you move a dead body. And then suddenly the ad man continues on, unloading his pitch with gusto as Kip informs Marvin that he needs his help in moving the body of his mistress who accidentally hit her head on a sharp furniture edge following a motel tryst. Terrified of not only losing his lovely wife of seven years but his position as his employer’s “boy wonder” due to a likely police investigation that would surely tarnish his GQ meets Forbes ready image, Kip turns to the man he’s always counted on as being “down for anything” his whole life. Knowing that he has far fewer ties to the unlucky lady than Kip does, after giving him one last opportunity to call the police, Marvin sends his friend home and goes on autopilot cleaning it up until things start to go very wrong. Haunted by the event, he begins visiting Kip, not quite understanding that this enormously amoral favor Marvin had hoped would bring him closer to his estranged friend may be the very thing that just might drive them apart. 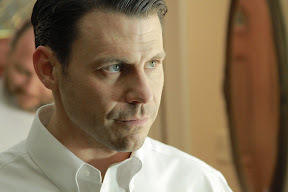 Growing increasingly demanding, unpredictable and unstable, Marvin begins sidling back up to Kip for an escalating array of favors of his own that results into a shocking confrontation between the two as they find themselves embarking on a deadly path from which there’s no return. As Kip begins trying to meet Marvin’s first few demands for loans and an introduction to a single friend of his wife’s, Osbourne uses the complicated dynamic of push and pull and give and take between the men to raise a lot of valid questions about friendship. And as extreme as the situation is in which the men find themselves onscreen, their dominant power struggle for Alpha status that’s fueled by both pride and envy is incredibly revealing. Likewise by combining the thrilling narrative plotline with universally relatable issues about the evolution of a relationship over time and if history does in fact trump other concerns such as whether or not you still have anything in common with a person who meant so much to you in your past, Favor transcends its genre trappings. An extremely well-acted, dialogue-heavy metaphorical two-handed poker game that plays out between the dueling dual leads as each one bluffs for position in their ever-changing codependent dynamic, Favor is elevated by the tremendous against-type performances by Weaver and Day, who I was amazed to discover had never worked together before. 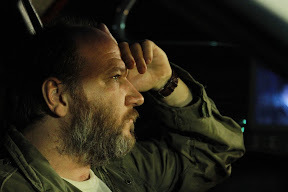 Filmed over the course of only eighteen days (following a successful Kickstarter campaign), Favor is a true testament to the talent of Osborne. A remarkable achievement that once again proves that all the money and A-listers in the world can’t save a film that doesn’t have a strong foundation upon which everything else relies, Favor is anchored by the exceedingly clever, multifaceted screenplay that garnered the filmmaker and feature awards and recognition on the film festival circuit. 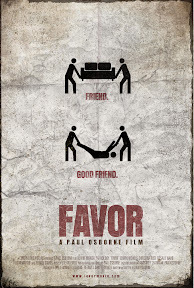 Released this week for sale and rent as part of a digital video-on-demand campaign through a wide variety of online distributors (including iTunes and Amazon), Favor is bound to make you ask yourself a great number of questions the next time somebody asks you a favor. Nonetheless, Paul Osborne’s high caliber indie is the type of film you should do yourself a favor and check out, preferably in the company of someone you go way back with that you’re sure has your back should you need help moving furniture or talking movies since this one is sure to inspire great conversation. 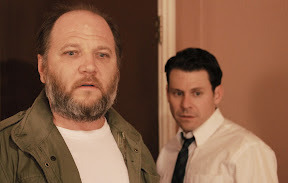 Reminiscent in mood and theme to Strangers on a Train, Blood Simple and House of Games as well as boasting conceptual and/or structural nods to Goodfellas and A Simple Plan, Favor is as entertaining as it is inventive. And because he builds a nightmarish situation that is not too far removed from reality, Osborne favors the audience by asking us to relate, attempt to outmaneuver and evaluate the morality play that begins to take shape in this Neo-Noir tale of Darwinism and the Golden Rule run amok.